1. Patriarchate of Constantinople - Official Site; English language. 5. Patriarchate of Moscow & All Russia - Official Site; English language. 6. Patriarchate of Georgia - Official Site; English language. 7. Patriarchate of Serbia - Official Site; English language. 11. Orthodox Church of Greece - Official Site; English language. The Fr. Georges Florovsky Orthodox Christian Theological Society is a graduate student organization of Princeton University. Its purpose is to promote the study of the life and work of Fr. Georges Florovsky and of Orthodox Christian theology in general in the context of Fr. Florovsky's emphasis on a return to Orthodox Christianity's patristic roots. Antiochian Orthodox Christian Archdiocese of North America - Official Site. Greek Orthodox Archdiocese of America (Ecumenical Patriarchate) - Official Site. Metochia of the Holy Sepulchre in America (Patriarchate of Jerusalem) - Official Site. Orthodox Church in America - Official Site. Russian Orthodox Church Outside of Russia - Official Site. Serbian Orthodox Church in the US & Canada (Patriarchate of Serbia) - Official Site. Holy Trinity Cathedral Liturgics - Various Texts, Directives, and Articles from Holy Trinity Cathedral, OCA Diocese of the West. Liturgical Texts - the texts are officially approved for use in the Diocese of Sourozh. They are made available here as a service to the English-speaking Orthodox world. They may be downloaded for personal or local parish use, but not republished without permission. 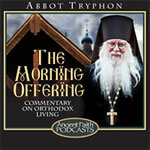 Great Orthodox Christian Liturgics Site done by Fr John Whiteford. A treasury of resources. The Psalter as a Book of Needs - According to the usage of St. Arsenios of Cappadocia, as transmitted by the Athonite Elder Paisios. Moscow Patriarchate News - News from the English language Official Site of the Moscow Patriarchate. Not as up-to-date as the Russian language MP Site. ROCOR News - News of the Synod from the English language Official Site of ROCOR. Almost as up-to-date as the Russian language ROCOR Site. ROCOR United - ROCOR United is an independent stream of news and commentary with a focus on the united Russian Orthodox Church Outside Russia and the Moscow Patriarchate. The ROCOR United Publishing Team is based in Sydney, Australia and has correspondents in various locations around the world and is the best ENGLISH LANGUAGE source on Russian Orthodox Church news and affairs on the net and is updated DAILY. Russian Religious News - Russian Religious News from the Site of Stetson University. Orthodox America - a superb on-line and print periodical containing many edifying Orthodox articles. Orthodox Family - Helping families establish and preserve an Orthodox Christian way of life. Published with the blessing of His Grace Archbishop Hilarion, The Russian Orthodox Church Outside of Russia. Bishop Alexander's Web Site - Orthodox articles and services in English, Russian, Spanish, and Portuguese. This is a growing, unique, and incredibly useful site. Orthodox Net - many articles, sermons, catechetical questions and answers, quotes from the fathers, as well as it's on-line directories and links, and more. The Orthodox Christian Information Center - The definitive site for information about Orthodoxy. If you could only visit one Orthodox site, this would be the one. Diocese of Australia & New Zealand - Parishes and monasteries in Australia, Lives of Saints, the Prologue from Ochrid, links and more. Diocese of Chicago & Detroit - Administration, Parishes, Diocesan News, Clergy News, Diocesan History, Diocesan Court, Diocesan Camp Vladimirovo, Photographs, Links, and more. Official Site of the Diocese of Berlin, Germany, and Great Britain, concentrating on the German part of the Diocese; German language. Diocese of Great Britain & Ireland - ROCOR Parishes and Monasteries in Great Britain & Ireland, Clergy Directory, Publications. ROCOR Directory of Parishes and Clergy - Online Directory of ROCOR Parishes by Country or State and Clergy by First or Last names. Russian Ecclesiastical Mission in Jerusalem - Administation and History of the Russian Ecclesiastical Mission in the Holy Land, the Monastic Communities and properties of the Mission, Maps, Photographs, and Pilgrimage Information. Russian Orthodox Church Outside of Russia: Official Website - An excellent comprehensive Site covering the Structure, History, and Legacy of the Russian Church Abroad, as well as up-to-date News.